TS-453B 4-Bay Professional-grade iSCSI NAS. Intel Celeron Apollo Lake J3455 Quad-core CPU with Hardware Encryption and exclusive USB type-C QuickAccess Port. The TS-453B comes with a sleek new look, featuring an OLED panel and two capacitive touch buttons. 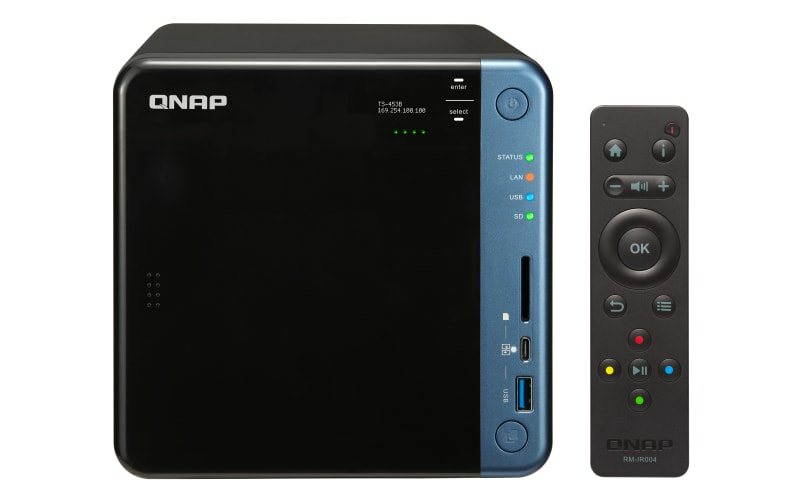 The TS-453B also features a PCIe port for boosting the potential applications of your NAS: the QNAP QM2 expansion card can be installed for adding an M.2 SSD cache/10GbE connectivity, a compatible wireless card can be installed to use the TS-453B as a wireless access point, and a USB 3.1 10Gbps card can be added for easier backup to/from multiple external storage devices. With a USB Type-C QuickAccess port and a SD card slot, the TS-453B simplifies transferring and sharing files without needing a network connection. The TS-453B also provides feature-rich multimedia functionality, such as 4K @30Hz video playback and real-time transcoding.